OMAHA — Track has Trials. Gymnastics has Trials. Hundreds of U.S. athletes get to an edition of the Olympic Games through the crucible of a Trials. But only the swim Trials is, to be frank, a triumphant celebration. This is what swimming does so much better than any other sport. It’s what the others — in other U.S. sports, in particular — could, and should, learn. To reiterate: the swim Trials are, first and foremost, a celebration. Everything else, no matter how stirring — the racing, the world-class production — is secondary. “We are a happy gathering of our tribe,” USA Swimming chief executive Chuck Wielgus said here Tuesday as the women’s 100 breaststroke heats were just about to get underway. That tribe, he noted, includes athletes, families, coaches, fans, officials, volunteers, donors and sponsors. “We like each other,” Wielgus said, and to a significant degree that is, remarkably, true, evidenced by the late-night get-togethers at the Hilton across the street, a gathering of the swim “family” from across the United States and the world. That lobby is where you see athletes and their families in a huge congratulations party — for instance, more than 60 people wearing a navy blue shirt that proclaims, “Dwyer 16,” all taking turns hugging Conor, who qualified Sunday night in the men’s 400 free and on Tuesday grabbed the No. 2 spot in the 200 free. When, earlier Sunday night, the Trials got underway and the microphone went out on Omaha police Sgt. David Volenec, just a few words into “The Star-Spangled Banner,” no one missed a beat. Everyone in the sell-out crowd of 13,426 picked up the song. When the song, and the crowd, ended, the sound in Century Link Arena segued to full-on, rousing applause. We live in an increasingly fractious world. Our American presidential politics, amplified by the idiocy and redundancy of cable news, can often seem like one big shouting match. Perhaps never before has America wanted, and needed, something like the U.S. Swim Trials. Here there are stars, and heroes, already made, and in the making. Michael Phelps, of course. He got his meet underway Tuesday morning with the prelims and semis of the 200 butterfly. He was fastest in both rounds, 1:55.17 in the semis — ahead by a full body length halfway through the race. "I said to Bob," a reference to his longtime coach and mentor, Bob Bowman, "I was like, 'Wow, I'm the only 30-year-old swimming in this event. That's awesome! And in two days I get to be 31!" And Leah Smith. Leah Smith? She just finished her junior year at Virginia. On Monday night, she grabbed the No. 2 spot in the women’s 400 freestyle, behind Katie Ledecky. And Townley Haas. Townley Haas? He just finished his freshman year at Texas. He is your 2016 men’s 200 free winner, Tuesday evening in 1:45.66. He touched precisely one-hundredth of a second ahead of Dwyer, 1:45.67. “It’s all still amazing to me,” Haas would say afterward. And Lilly King and Katie Meili. They went 1-2 in Tuesday night’s women’s 100 backstroke. King just finished her freshman year at Indiana; she is the Big Ten swimmer of the year. Meili is a 2013 graduate of that noted Ivy League swim beast, Columbia, who broke her hand about three weeks before the 2012 Trials. King touched in 1:05.2, Meili in 1:06.07. "I think it's interesting and also exciting just to have new faces of people who are really pumped to come up into this sport," Phelps said. "I think that's something that, for me, is a good thing to see as I'm on my way out." 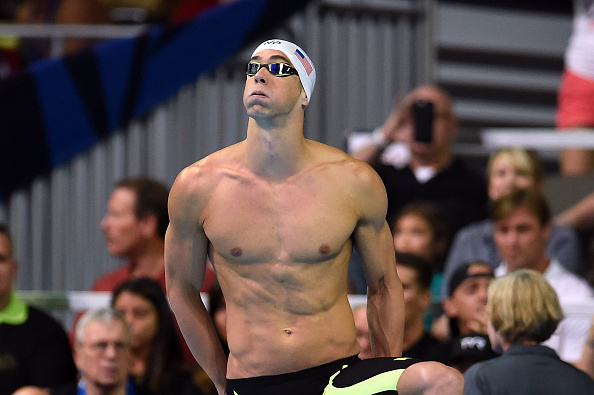 To a significant degree, the increasing success of the swim Trials is due to Phelps. Let’s make no mistake about it. USA Swimming, which has occasionally had its moments with Phelps along the arc of his unmatched career, with its well-publicized glitches, knows what’s what — an oversized banner of Phelps is currently decorating one side of the outside of the arena. All along, of course, Phelps’ avowed goal has been to grow the sport. There are 1,885 swimmers who qualified for the Trials from 48 states, all but Alaska and Wyoming, and everyone is racing for exactly 52 spots on the U.S. 2016 team. Math: roughly 97 percent of those in Omaha are not going to Rio. It’s not just that Phelps, with his 22 medals, has grown the sport. It’s that he made it cool — especially for boys, who might otherwise be tempted by skateboarding or other action sports. His son, Jonathan, an incoming senior at Northwestern, is here for the 200 back. “We have friends of ours from around the world who will be watching,” the father said. “We have so many families who are doing what we are doing. Missy Franklin has made swimming awesome for girls. She is the daughter America’s moms want their girls to be. That’s why corporate America has made Missy the face of swimming. On Tuesday, Franklin finished seventh in an event she used to own, the 100 backstroke, in 1:00.24, more than a second behind winner Olivia Smoliga of the University of Georgia, who touched in 59.02. Kathleen Baker, who just finished her freshman year at Cal-Berkeley, where Franklin of course had gone for a couple years, took second, in 59.29. "It's like this new wave, not out with the old because that's a bad saying, but it's in with the new-type deal," Smoliga said. Franklin had just 14 minutes between the 100 back and the earlier semis of the 200 free. She placed fourth in the semis. “Right now,” Franklin said after her Tuesday swims, “I need to make the team in whatever way that looks like. I need to make the team, and I’m going to do my best.” Upcoming for her: the 200 free (Wednesday), the 100 free (Friday) and 200 back (Saturday). Swimming, if it teaches anything, teaches humility. Genuinely, virtually everyone on the U.S. national team will prove humble about what they do. And, for a sport that is obviously an individual endeavor, oriented toward the concept of Team USA. Ledecky’s swim was the third-best women’s 400 ever. Smith’s made her the fourth-fastest performer ever. “… Just to look up on the board and see how great of a swim she had, too, is just really inspiring and exciting moving forward,” Ledecky also said. On Tuesday night, Ledecky cruised to the fastest-qualifying time in that 200 free, 1:55.1. Again, Smith followed, second in 1:56.73, 1.63 back. Allison Schmitt, the London 2012 gold medalist, ran third, 1.95 back, Franklin 2.23 behind. This is how good Ledecky has gotten across the board since London, when she won the 800. This is a basic truth, too: the swim Trials are fundamentally exciting. Three guys went into Tuesday night’s 100 backstroke with two spots on the line: Matt Grevers, the 2012 gold medalist; David Plummer; and Ryan Murphy. In Monday’s semifinal, it was Plummer, Murphy, Grevers, all of 52-hundredths of a second separating the three. Tuesday’s final: Murphy, Plummer, Grevers. Murphy touched in 52.26, Plummer two-hundredths back, Grevers a half-second out at 52.76. The racing goes off to the kind of athlete introductions you might see when a closer comes into a Major League Baseball game; the medal ceremonies see the house lights go down; there are fireworks. The big-screen dance contest, with kids and others, typically proves hilarious. These 2016 Trials are the third in a row in Omaha. For the first time, there’s a local live site, a few blocks away from the arena. New this year at the nearby fan zone: virtual reality. “You always try to raise the bar in some capacity,” said Harold Cliff, who runs the Trials. There’s an autograph schedule each day populated by former U.S. stars. Tuesday’s: Ariana Kukors, Mark Gangloff, Misty Hyman, Gary Hall Jr. and Chloe Sutton. “I”m watching little kids asking anybody to autograph their stuff,” said Mike Kohner, 54, of Boca Raton, Florida, whose 19-year-old son Gage is an incoming junior at Northwestern and raced the 50 free in Tuesday afternoon’s time trials. Across the street, open-water star Haley Anderson was available at noon to the press. Want to watch news conference video? Sure thing. Check in on the USA Swimming daily preview and recap shows? No problem. At the pool, each session, start to finish, whether morning prelims or evening finals, takes two to two and a half hours, max. There are no long stretches, as there can be in track and field, for instance, when nothing is going on. Again in contrast to track, where there often are multiple events going on, and fans truly don’t know what to look at or for, in swimming there is one event — and one race only — going on at a time. It’s all so accessible. And understandable. Even if you have never, ever been to a meet. And then there is the ultimate — making the team. Kevin Cordes finished third in the 2012 men’s 100 backstroke Trials, 43-hundredths out of an Olympic spot, behind Brendan Hansen (who would go on to win bronze in London) and Eric Shanteau. On Monday night, Cordes won the 100 breast, in 59.18. As heartfelt a moment as that was, consider: Cody Miller took second, eight-hundredths back. “You know, I grew up idolizing guys that win this meet, you know. My first time was in 2008, and I was just lucky to be here and swim as a high schooler, and then in 2012 I was lucky enough to make a final — the 200 IM, a couple lanes down from Michael,” a reference to Phelps, who was in Lane 5 in that race, Miller on the outside in Lane 8.